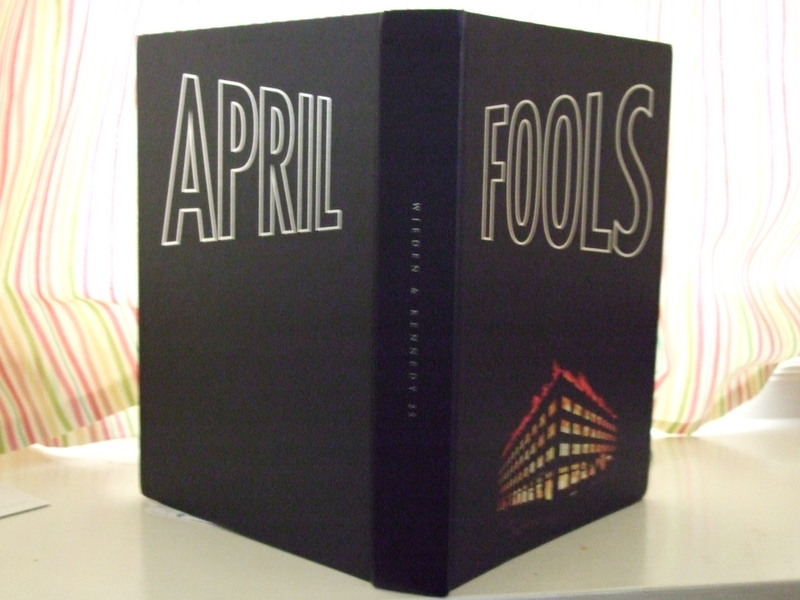 I just received a large, thick book from W & K with the word April on back and Fools on the front. It is filled with pictures of tragically hip, tragically fabulous, tragically creative- seeming, tragically cool pictures, ideas and thoughts coughed up by W & K employees around the world. My first thought was, what a waste of paper, but no, there is a bookmark stating, “…Green Process…saved 150 grown trees…” etc. etc. I am shamed in my uncomplimentary thinking of this them. I got said book as a gift? rejection letter? promotion tool? in response to an employment experiment I participated in with W & K where I was not hired. I was not even being considered for hire by them several months ago, but I can say that the book sparked an intense longing to work at a place that could so brilliantly spark an intense longing for something–man, what an excellent marketing tool. You guys are preaching to the converted, baby! Previous postCrime against nature or unstoppable subjugation of, and by species?